If you make your own Christmas presents instead of stressing out about the lack of a huge budget, this will bring some real meaning to Christmas, reduce carbon footprints to cut down waste and packaging and help to take the commercialism out of the season. Christmas isn’t about the amount of money someone spends on a gift. It’s about the fact that you took the time to personalize the gift and put some thought into it. This is difficult to comprehend for people, but they need to stop and remember that the people who are receiving the gift are the ones who are closest and they won’t care about cost. They will appreciate whatever you give. If you make your own Christmas presents instead of mechanically shopping quick at the local department store just to get the chore done, you‘ve just taken an opportunity to show someone else you really do care about them. It also means you’ve taken responsibility with a limited budget to use it wisely and make handmade Christmas gifts. The Dry Ingredient Baking Jars Are Very Popular. If you have a special dessert recipe you think someone else will ultimately like and want to try, this is a nice idea. You can use this idea for bread or cookie recipes. If you are handy with a computer, put those skills to work and type out the recipe on stationary that has Christmas decorations printed on it. The recipe needs to do a few things. It should list in addition to the dry ingredients, what should be added. It should also indicate the proper dish to use when baking, what the temperature should be set at, baking time and anything else you think important to know about the recipe. Pick a jar large enough to hold the dry ingredients. 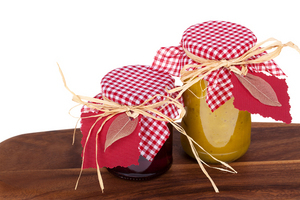 If you layer the ingredients one at a time, a neat layered effect happens making the jar look quite attractive. Be sure to dress up the jar in Christmas fashion with a bow or some paper for the festive look. Glue the recipe onto the jar or attach it to the top with ribbon. If you have baskets around recycle a few for Christmas recipe gift baskets. By recycling, you save time going out to get one and you save money too. Think about Christmas Dinner or Christmas Day and some of the things that go with it. Give your handmade christmas gift a theme if you want to by supplying goodies like all spices, salsas, a variety of pickles, just cheeses, crackers, or whatever you think the person or family receiving it would like Christmas Day as snacks or part of their dinner menu. Don’t forget to decorate the basket xmas-style and if there are recipes involved, write them out and attach. If you have to buy for someone who you don’t get to see often, gather up your own family pictures and make a scrap book for them to see. Try and use the most updated photos as you can of you and your own kids or spouse. Take some pics of your new house, new surroundings or new pet even. Or make a scrapbook in the form of a CD they can play. Make a story out of what you or you and your children have been up to in the last year and supply the pics. Add a little description in a journal for them to read through. This is an extra special gift for direct relatives, and certainly a gift that will not be tossed aside ever. It’s timeless and very thoughtful and special. It’s a little bit of history that can be kept forever. Make someone some blank cards that can be used at anytime. If you know the person well, you can decorate it in a personal way with material or stickers. Envelopes can be bought very cheaply and so can decent paper. Fold the paper to form a card, and decorate as you think your friend or family member might identify with. When you make your own Christmas presents geared to the likes and tastes of the person receiving it, it’s not a chore anymore. It’s a perfectly eco-friendly and a very meaningful way of expressing good thoughts and best wishes for the Holiday Season. Join in and write your own page! It's easy to do. How? Simply click here to return to Going Green Opinions And Tips. I promise to use it only to send you Carbon News Monthly.